AKIPRESS.COM - More than 500 Australians have called for emergency assistance after storms lashed Sydney and nearby regions, causing floods, power cuts and flight delays, BBC reports. 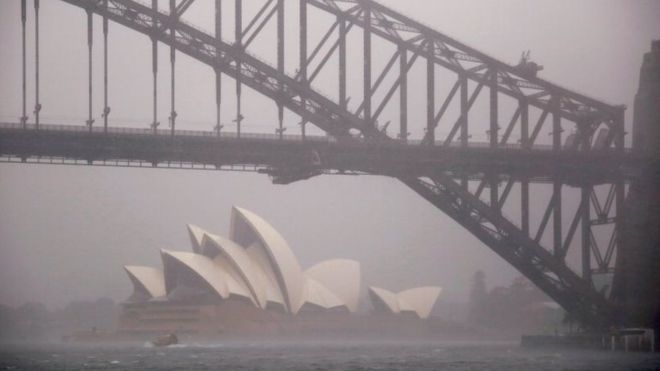 Sydney had its average monthly rainfall within just two hours on Wednesday, according to meteorologists. Authorities said at least 11 people had been rescued from vehicles trapped in floods. One man died in a car accident. Two police officers were injured in Sydney after being hit by a falling tree while trying to help motorists, authorities said. The weather played havoc with the morning commute in Australia's biggest city, with many transport services cancelled or delayed - including more than 50 flights. Australia's Bureau of Meteorology said it was the region's wettest November day since 1984.